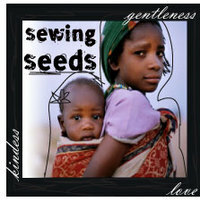 I am so excited to announce a new Sewing Seeds project! 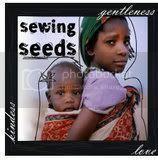 Sewing Seeds started two years ago when my oldest daughter went on a missions trip to Africa. In an effort to support her and help the kids she would be blessing while she was there, we managed to gather 118 handmade skirts for her to stuff into her suitcase. The sweet people who visit my blog made this possible! As far as my blog is concerned, this is the #1 topic of email and inquiries that I get: ladies wanting to know if we need more skirts. I have been patiently waiting for a new project to turn up and it has in the form of my friend Kimmie's daughter Bella who will be traveling to Costa Rica this summer for 2 weeks. Bella is following in the footsteps of her parents who have a tender heart towards missions and orphans, which is evidenced by the fact that they have 7 children, one homemade and six adopted. They are truly a precious family that loves God and seeks to follow Him in practical ways. If you need encouragement or prayer, Kimmie is your go-to-girl! This project is much like the last one in that we are asking for your help in gathering skirts and shorts for Bella to take to the kids in Costa Rica. I love to think of the kid's faces when they receive something of their own. Something lovely and new. I think this a perfect way to show them that they are loved. All of us pulling together will be able to make a lot of kids smile! So, could we ask you to consider making a skirt (or two) for a little girl? Most sizes are needed and can be used. I figure that each skirt will cost approximately $10 to $15 to make and 2-3 hours to put together, depending on your sewing abilities. One idea is to make a skirt in your own daughter's size and let her pick out the fabric. This makes it a mommy/daughter endeavor! Here are some links to skirt tutorials: tiered skirt tutorial, easy skirt tutorial, lazy days skirt pattern, twirly skirt tutorial, and the drop-waist twirly skirt tutorial. Wow! There are lots of choose from! If sewing is not your thing, a pair of shorts for a boy will be perfect. A sturdy pair of jean or khaki shorts will be perfect for a hard-playing little boy to wear this summer. We will not requesting particular sizes (except to ask for clothes for kids ages 13 and under) or a goal amount because we trust God to take care of that. He knows what is needed and will bring that about. We need to have the skirts finished and mailed by June 29th so that Bella can get them ready to transport. If you are interested, please leave a comment saying so (please make sure that your email address is correct so I can respond to you) and I will send you more information and Bella's mailing address. ***Please feel free to link to this post and to download the graphic for use on your own blog. Thanks!